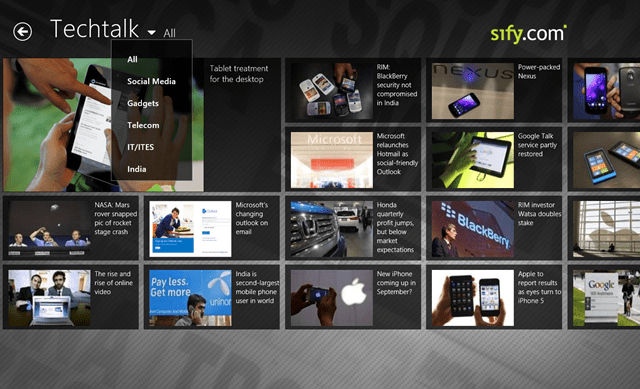 Sify News is a free Windows 8 News App used to connect you with the outer world by keeping you abreast with all the latest around the world updates. It’s an online news service which will let you know about the current happenings around the globe and also from your local areas. Everyday you watch news on your boring television set thinking about “ what kind of rubbish is this? Where is the actual news”? Well, now here is the real and latest news for which you don’t have to wait. Just switch in to the Sify News app form sify.com and check out the latest news and opinions. Browse through the current happenings nad trends from various sections like Finance, Sports, Technology and Movies. Catch up with your favorite celebrity gossip and Bollywood masala. Also, you can listen from the Tech Gurus about the latest technologies and gadgets. 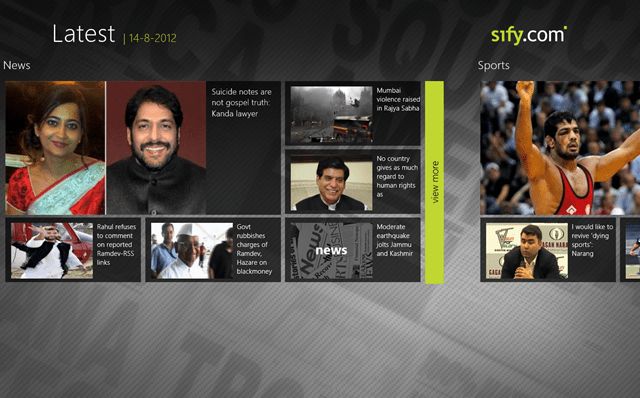 News online on your desktop powered by Sify at this News app for Windows 8. Select the upcoming news from the sections and checkout what’s actually happening on the National and International level. Check out the Olympic Champions on the sports column and keep yourself updated about share market from the finance column. Select your favorite sports from the sub-section and you can select the spot which you want to know about. Keep yourself updated about the economy and currency price, the dollar, the gold and every other stuff related to finance. Students and gadget freaks can browse through the Techtalk section and can know about all the latest gadgets and get expert opinions from renowned gadget gurus and technical masters. Get knowledge about the social media platform and various other tech trends. So, get this amazing Windows 8 News app for updating yourself about the latest happening and latest trends form this free Windows 8 News app available under the “News & Weather” category.